You are currently browsing Xavier Quesada Allue’s articles. Recently, Portia Tung was reviewing my session proposal on Visual Management (with Laurent Morisseau) to the XP Days Benelux 2009 conference. She commented that it would be nice if I could give some scientific background for all this Visual Management and taskboard stuff that I write about. Since half my family and many of my friends are scientists, this is a challenge too tempting to pass. The only thing I ask of Portia is to understand that this is not something I can put together in a couple of weeks! I will try to (slowly) start adding some scientific theory behind these writings. Iteratively and incrementally, starting today. By coincidence, last week my friend Ariel Aizemberg sent me a TED Talk video that is spot on the topic and makes a good starting point. This video is short (6 minutes), informative and entertaining. Even if you don’t care about science too much, you will surely enjoy the presentation style. In Scrum, the “Scrum of Scrums” is a way to ensure alignment and coordination across different teams, or among different sub-teams of a large Team. How big is the Team? A Team is a group of people collaborating towards a common goal. Sometimes it’s not that easy to pick your goal, and thus figure out who the Team is, or who it should be. On one hand, small teams are good. Small is simple, small is beautiful. So maybe you should pick a small goal, and make a small Team. On the other hand, you should try to look at the system as a whole. This could mean anything: a project, a department, the whole company… What is the ultimate system, but the Organization itself? Your whole company is the Team, from the Systems Thinking perspective. Especially for small companies. So maybe you should think of a large Team. Most likely, we need to strike a balance between these two dichotomic approaches. I have found my comfort zone with a simple, practical definition: One Team, One Backlog. Let’s assume you found your definition of Team, and you have more than ten people in it. Since the ideal team size is 5 to 9, you probably want to split them up. But you don’t want to lose the concept of one Team. The recommended approach is to break them up into sub-teams. I will discuss some ideas for creating these sub-teams and for visualizing their work, while trying to keep and respect the spirit and vision of the one (big) Team. Using the same logic regarding why it is interesting for team members to be as cross-functional as possible, the best strategy for making sub-teams is to create cross-functional feature teams, as opposed to ‘component’ teams or -god forbid- teams that specialize in a certain technology or skill (like ‘QA team’ or ‘.Net team’). Feature teams are teams that work on features, i.e. stories. Pieces of business value. They are value-driven teams, whereas other sub-team splitting strategies (component, skill, etc) create function-driven teams that invariably fail to deliver business value and create local optimizations and waste. You create your feature teams by spreading out the knowledge, skills and experience equally. The goal is that any team can do any story in the backlog. You should stress that the “real” Team is the big one. Sub-teams are just created for communication and coordination purposes. In my opinion, they should not develop too strong a team identity. For example, I would not measure sub-team velocity, and I would make sure people rotate from sub-team to sub-team a lot. 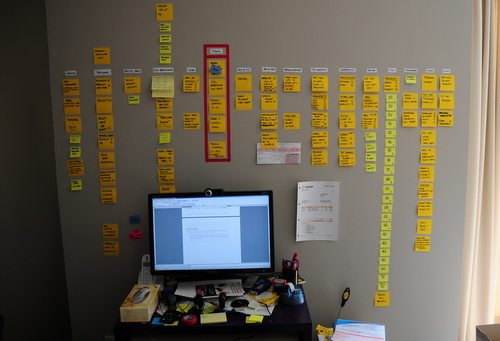 You can then work with a single, large backlog and distribute stories in round-robin fashion. I like to give sub-teams a color for a name. E.g “Red team”, “Blue team”, etc. Colors are very visual and we will be able to use this to our advantage. For example I use electric tape of the same color to create their taskboard, which gives them an immediate strong visual identity (see picture below). Another reason colors are good is that they are non-hierarchical, and people don’t attach themselves that much to a color. In large projects, particularly in transitioning organizations, there are always some people left floating around that are not doing any actual work at team/trenches level. I put them in the Black team. This is a pseudo-management team that mostly combines the responsibilities of Product Owner and Scrum Master (in the same team, not the same person!) and any other role that you either want to share across teams or that you simply can’t get rid of. As you can see these were mostly roles that existed because we were doing Scrum within a traditional large organization. In any case, the idea is to group all these people into one “team” so as to not leave any loose ends. Ideally they will jell and work cooperatively, otherwise at least you can visualize their work by putting up a taskboard for them. For example on this picture below, most tasks are either impediments or things that have to be delegated to people outside of the Team. The horizontal lines are not stories but simply priority slots, i.e. High Priority, Medium and Low. If I would have known at the time, I would have put WIP limits, because nothing was ever getting done here. Ok, let’s move on to the interesting part. 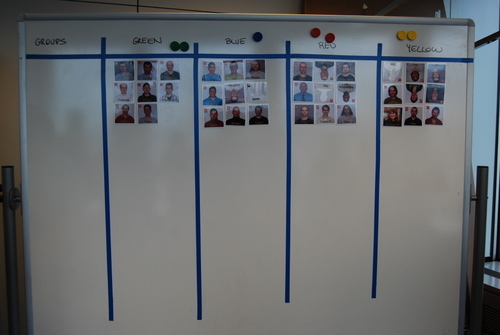 Each sub-team has their scrumboard with the stories they have selected for the current Sprint, divided into tasks as usual. How do we visualize what is going on at Big Team level? How do we keep track of so much work? We need to change the level of granularity. In the Scrum of Scrums, you only visualize stories. You create the “Scrum of Scrums storyboard” where every story that is currently open is visualized, with the team that has it and the current status indicated. The picture below shows such a board at the beginning of a Sprint. Click on the picture for a larger version. 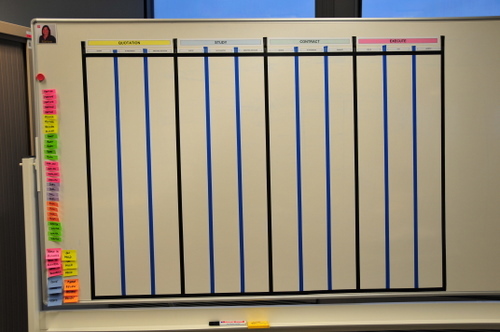 Note: This is actually the same physical whiteboard as pictured above… you are just looking at the other side! The Scrum of Scrums side is pointing towards the hallway, so passer-bys can look at it. There are only two columns: “Story” and “Status”. Story has a copy of the story card that is on the team board. Status is normally “not started, “in progress”, “done” or “done-done” (a curious distinction between “we think we’re done” and “we’re sure we’re done”). This last done-done was indicated with a red star. Each story has a little magnet indicating which team is working on it, but we also experimented with other visual elements like creating status tags of the color of the team. In this example you see both at the same time: a Green Team story will have a green “in progress” tag, and also a green magnet. 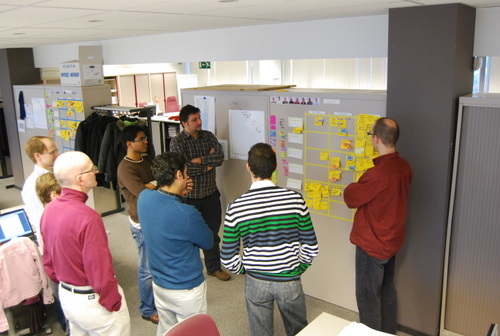 The mechanics for the Scrum of Scrums are simple: after the daily Scrums, each team sends a rotating delegate to give a brief status report on each of their open stories to the other delegates and the Product Owner. The delegate is then responsible for updating the rest of his sub-team members on what’s going on at project level (something that never happens, but oh well). Of course sometimes a lot more people show up during the Scrum of Scrums. Anybody who is interested in knowing what’s going on at Big Team level goes. Note: The black and blue tape indicate nothing in this case, we simply didn’t have enough tape of the same color, and our boss was a fan of Club Brugge (whose colors are black & blue), so we made it for him. Note how you can quickly visualize different types of problems. Several top priority stories are not getting finished. In particular the #1 top priority story. The yellow team seems to be in trouble. I see 3 yellow “in progress” and only red star with yellow magnet. Also comparing yellow to green, red and blue you can see the difference. If you looked at the large version of the picture, you probably noticed those white horizontal lines that say for example “End of Sprint 9 Demo: 8/Sep”. This is a visual way of indicating what was the scope taken for Sprint 9. The point here is that this was a Team that was not delivering all they started, and was dragging along open stories. Some stories were blocked, others underestimated, some teams had sick people… for whatever the reason work wasn’t getting finished, and since it was not possible to limit WIP for political reasons, we just let the teams take more work, keeping existing stories open. But with this board at least the situation was kept clearly visible and the Product Owner knew perfectly well what was going on. I would like to refer to these two as “hard commitment” and “soft commitment”. People without hard commitments work without deadlines. Their work is done when it is done. An example is scientists or people working in Google-style companies. “I am committed to this team” or “I am committed to this project”. People without soft commitment are people who “just want to get their work done and go home”, typically because they either don’t enjoy their work or they are demotivated or burned out. What type of commitment do we care about in the Agile world? As it turns out, we seem to care about both. And we don’t distinguish too much between them. But there is a big difference between the two. Hard commitments are typical in command and control, plan driven environments and dysfunctional organizations. This is a world where deadlines abound, monitored and enforced by armies of Gantt-chart wielding project managers who love to micromanage. In these projects, hard commitments are everything; and they translate into unmissable deadlines that themselves translate into long working hours, unsustainable pace, cutting on quality and eventually large turnover and technical debt. A defining characteristic of these environments is that there is generally punishment envisioned for not living up to your hard commitments. From not making your bonus, to being publicly chastised by your boss, all the way to being fired; failing to comply with hard commitments is taken very seriously in these organizations because deadlines are the heart and soul of plan-driven management processes. Missing deadlines, simply put, costs money. Lots of it. Money in change management overhead, and money in penalties over contractual obligations missed. Soft commitments, on the other hand, abound in startup type organizations, small projects and any environment where people are happy, work as a team, take pride in their work and care about the result. Scrum is a framework that requires both soft and hard commitments from team members. The team is required to work as a team (for which soft commitment is required) and to commit to finishing a certain amount of work in one Sprint. Now, I don’t like hard commitments. I associate them invariably with command and control thinking. It is all too common to force people into accepting a hard commitment, by insinuating that bad things will happen if we don’t make a deadline or simply by giving an order: “make the deadline or you’re fired”. But, in contrast to plan-driven processes, the difference is that in Scrum the hard commitment comes from within the team itself. It is not imposed from above. This is why many people see it as a “healthy” hard commitment. Have you ever seen a Scrum team that does not make its sprint goal? Of course you have. In fact, failure to meet hard commitments in Scrum is so common, Jurgen Appelo blogged about it today. Let’s now compare Scrum with with plan-driven processes. What happens in Scrum if a team does not make its commitment? Nothing; since the Product Owner already knew they were behind schedule and adjusted her expectations a week ago. The team feels bad about it. Someone might cry (yeah, right). They go into a retrospective to make sure it doesn’t happen again. Then they go for a beer. See, in Scrum there is practically no external punishment for not delivering. Nobody will get fired. Nobody will lose their bonus. The only “punishment” is the team feeling more or less embarrassed because they overcommitted. This can hardly be seen as punishment when compared to a command-and-control organization. Delivery in Scrum is governed by Systems Thinking. Essentially this means that if a team does not deliver all it promised, it is not the team that is at fault, because it is out of their control. It is the system that governs performance. (In this case, the system refers to the way work is chopped up and estimated and velocity is calculated.) “Not making it” only means that System capacity is lower than expected, or the system is unstable. The common solution is to reassess your expected Velocity to make it lower, and take less work next Sprint. And maybe to divide your work into smaller pieces. In any case, there can and should be no punishments dealt to the team. So what is the value of making a hard commitment without punishment? What’s the point of committing to something, if everybody in the game knows that when we don’t keep the promise, nothing will happen? Hard commitments in Scrum might, in practice, not be as ‘hard’ as they seem. Why try to make them look harder? On the other side of the spectrum, we have the new Kanban ultra-lighweight framework. In Kanban there are no iterations and no hard commitments. You just limit Work In Progress and pull in work. Things are done when they are done, based on prioritization, cycle time and lead time. Proponents like to state that one of the benefits of Kanban is that it is a framework that (unlike Scrum) you can put in place in existing waterfall organizations without requiring disruptive change . 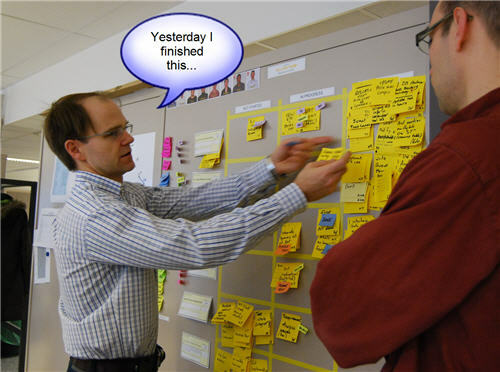 Kanban works along with the pre-existing method. For example, a tester just has test whatever he pulls into his plate and pass it along. No teamwork or commitment is initially required where it did not exist before. (Note to Kanban advocates: of course undoubtedly things will be better if there is a commited team; but the idea, if I understand correctly, is that Kanban will plug into the existing process, with or without a team). What would a framework in the upper left-hand quadrant look like? Soft commitment without hard commitment? It would require healthy, self-organized teams. It would require no deadlines, no “sprint goals”. I believe both Scrum and Kanban can evolve in this direction. For Kanban, it would probably mean adding the restriction that people have to work as a self-organized team. It becomes the responsibility of everyone to get work to fully done. This would maybe make Kanban less suitable for immediate implementation in waterfall organizations. For Scrum, it would mean dropping the restriction that Teams have to “commit to delivering a certain amount of features during a Sprint” and going towards a more continuous flow paradigm. In this way, at Sprint Planning, teams would just pull the amount of stories they think they can do, but without explicitly committing to finishing them. They would do their best, and any unfinished stories would simply remain as top priority for the next Sprint. The Product Owner would monitor Velocity and progress during the Sprint, and adjust her expectations of what will be delivered accordingly. It is really just a simple change. Almost insignificant. Camp A, the “Transitioning organization” camp: this is the camp that has two faces. Inwards they do Scrum, outwards (towards their external customers, or towards Senior Management) they maintain a plan-driven façade. They are in transition, having implemented Scrum internally but failing (or not yet getting around to) selling it to external stakeholders. The problem with this camp is that many times they cannot or do not shield the Team from the external stakeholders. They pass on the Sprint scope as a hard commitment to the outside world, creating pressure on the team. Still, they are trapped with the problem that they cannot punish the team if it fails to achieve. Scrum in such a situation is very difficult. Camp B”: the “People are Lazy” camp: this camp believes that people are not intrinsically motivated to do their best, and need someone with a whip (even if it is an imaginary whip in the form of a deadline) to keep whipping them in order to work hard and do their best. They think that people are naturally lazy, and if we would have a world without clear goals or deadlines, nobody would get anything done. It is surprising the number of software developers who think this way even of themselves. This is more difficult to challenge. I don’t agree with this camp mostly on philosophical grounds. Basically I do not believe that this is true of human nature. Maybe I am idealistic. Or maybe they are right, and it is true that most people hate their job and are not intrinsically motivated to do their best. Or maybe we have been living too long in a command and control culture. So long that we have forgotten that work is one of the fundamental human rights, and many people actually like to work . In Visual Management for Agile Teams, I discussed the importance of usability and good design when building our taskboards. Today I want to focus on how we write our tasks, and try to make a case for increased readability. Readability is defined as “how easy it is to read something”. There are two meanings, as in “a readable handwriting” and “a readable book”. In this case we will focus on the first definition as it applies to answering the following question: how easy is it to read the tasks on our taskboard? Tasks should be easily readable and understandable by a person with normal sight from a distance of around two meters. Why two meters? Because it is a reasonable (maximum) distance from the board you can expect people to be standing at during the daily standup meeting, and when passing by. 1) Small amount of text: tasks should have no more than 10 words, as a rule of thumb. 2) If handwritten, text should be written in big, bold, capital letters. Tasks should have no more than 10 words because fitting more text into a 3×3 inch (76×76 mm) standard Post-It forces you to write too small, and we want to avoid that. But there is also another reason. You shouldn’t need to write a lot of text if you understood the nature of tasks and how to use them in your process. Tasks are meant to be pointers to the work that has to be done. Reminders. Not a full analysis or description of what has to be done. The goal of a task is to represent a unit of work. The details of the work should be in the person’s head, having been discovered and defined by having conversations with the other team members. 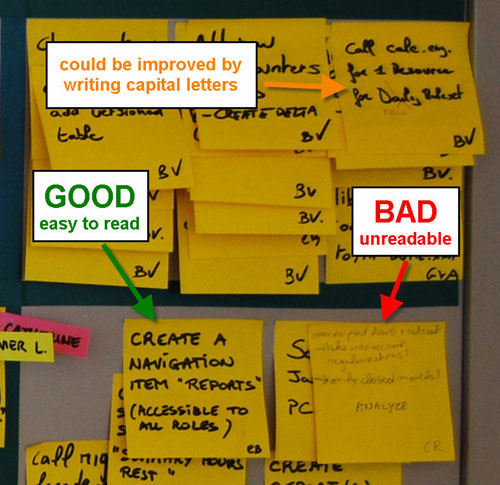 We should avoid documenting tasks on the post-its as much as possible. We should also avoid using sticky notes as “documentation hand-offs” between team members. The reason for using bold letters is to increase readability of the text. Bold is required because of the distance we want to read from, and the size of the font we want to write in. Writing 10 words on a standard post-it in ballpoint pen in a text size that fills the post-it would result in a font that is too lightweight and disproportioned. Most likely what will happen is that people will write the 10 words in a very small font, thus rendering it illegible from the required distance. The reason for writing in all capital letters is that lots of people have bad handwriting, or write in cursive when not writing capital letters. This makes a task difficult to read even if it complies with the 10-word rule and is written in big bold letters. We are not trying to learn to decipher your doctor’s handwriting here, thank you. See above example in orange. Text written with colored markers. Text written with whiteboard marker or dried up markers. If tasks are readable from two meters without effort, they might also be somewhat readable from a distance of up to 5 or 6 meters. If the taskboard is in the work area, chances are most desks will be located within this radius. This means that team members might be able to read the taskboard from their desk, something desirable. As an example, in the picture below, most desks are within reading distance of their taskboard. A black permanent marker with a rounded tip is the only writing tool you will need. If you take care of it well (you close the lid carefully and don’t press too hard on the tip when you write) it will far outlive your project. They are also very cheap and it is not unreasonable to give one to each team member. There are several brands in the market. I have tested many of them and my top recommendation is the Edding 3000 which I can get for around €1 a piece here in Belgium. 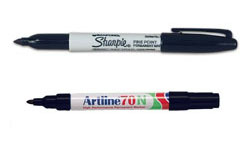 Top contenders and good substitutes are the Sharpie classic and the Artline 70N. 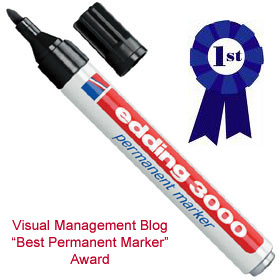 As an extra, the Edding 3000 and some other brands come in a mini-marker version which is ideal for the purse of the lady Product Owner or the pocket of the gentleman Scrum Master. Any similarity between this guy and my desk is purely… frightening. I hope these things don’t start moving on their own! 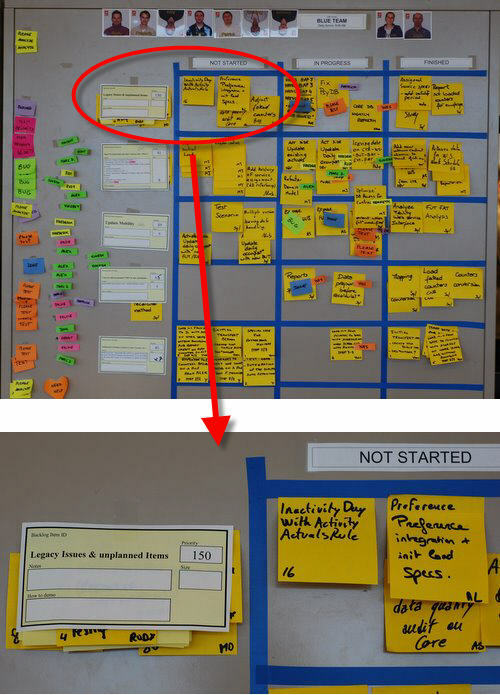 Here are some examples of Kanban boards I built for a friend. I was not coaching these teams, so I did not have any say on the process. 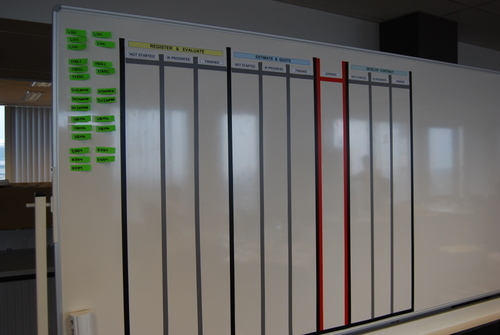 My job was simply to build a board that would reflect their current process, using my Visual Management guidelines. These boards are for a corporate unit that acts as a sort of “enterprise proxy product owner”. They receive business demands from multiple business units, they analyze and classify them, and make a proposal to the customer. They also make recommendations such as build or buy. If the proposal is approved, they send it to development and follow it up into production. I was very happy with this solution from the visual point of view. Unfortunately they realized that it did not reflect their process accurately so I was asked to tear it down and start over again. Note that I used different colored tape to indicate internal columns from state-boundary columns. In the first board I had used gray tape, which I like more than the blue tape in this picture because it connotes better the idea of sub-columns. 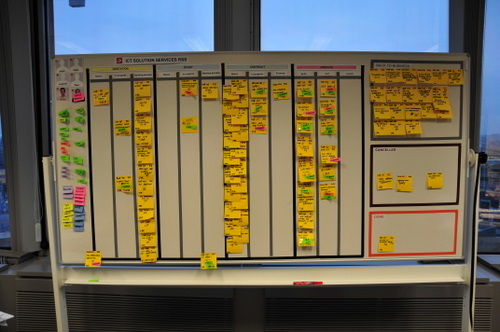 These boards were accepted and populated with kanban cards. Each card is a Super Sticky Post-It, representing a customer demand as it flows from being submitted by the business to being deployed into production. Note how immediately upon populating the board the bottlenecks became visible. This board represent the initial state this team was in when they decided to visualize their workflow. They also put some sections out of the swimlanes for special things. For example jobs that get cancelled or sent back to the business. Those are the boxes you see on the side. Here is a closeup of the main part of the board. A good way to know if your team is using their taskboard to really manage their work is to look at their daily standup meeting. A team that is using visual management to manage their work will always do their daily standup against the board. During the daily standup you update your team members on your work. Both work finished the day before and work still in progress should be clearly indicated on the board. It only makes sense to go over the board as you talk. This is both easier for you and easier for team members. It also helps to visually place what you are talking about in context. If you are using the DONE tag, nametags, status tags and the three columns; then there is a very simple guideline to make sure you don’t forget to talk about anything important every day: do the daily standup against the board, and make sure all tasks in the middle column (“in progress”) are talked about. Mary Poppendieck, Henrik Kniberg and a bunch of other people are on a Lean Tour in Japan that might turn out to be historical. According to this blog post, a Toyota software development manager has spoken openly for the first time on how they develop software, and guess what? Yep, it’s waterfall. We’re waiting for more details on the Lean Development list regarding how they manage to pull this off and what they think of the Agile community, but I think we’re going to learn a lot here. The person we heard from at Toyota – Ishii-san – deals with embedded software in production automobiles. I understand that for a prototype part, software can take a matter of days. In production parts, the cycle was 3 months. When you are dealing with embedded software in production hardware, a 3 month waterfall is really fast. And note that at Toyota, people really do talk about “bad news first”, so what we heard about is what they consider a problem, as opposed to what is going well. To answer your question about agile, Ishii-san said they are studying agile, but their architecture is not particularly supportive of it. His real motivation, as I heard his comments, is that improvement is necessary because of the late detection of defects. I imagine that they will focus on early removal of defects, and adopt whatever processes prove (after PDCA cycles) to be more proficient at doing this. Toyota people will not just do agile because someone says it is good. They will look at their objectives and adopt whatever process gives them more of what they consider good. And Toyota is VERY good at doing this – I would not want to be competing against them! Putting team member pictures on the team taskboard is another good idea. This is particularly useful for large organizations that have many teams and lots of people. Helps you match faces to names when looking at the board, especially if you use nametags. Eliminates all uncertainty regarding who is in what team. People get one picture and can only belong to one team. Helps find people in large offices. “You have to talk to Susan from the green team. You can see her picture on their board”. 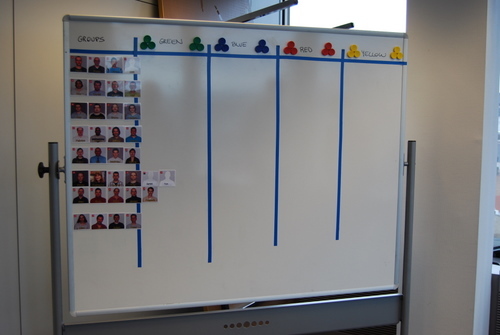 Changing teams, or going on loan to another team for a Sprint, is as easy as moving your picture and nametags from one board to another. We turn around a picture to indicate that the person is not present today. This helps you not lose time looking for people that aren’t there. We also put cell phone numbers of team members on the back of their picture. No more going crazy trying to find the number of Johnny! We also use team pictures to do literal “team building” exercises. Every now and then you might want to reshuffle and reorganize the teams. You can take all pictures into a meeting room with a clean whiteboard and brainstorm how new teams would look like. This is a highly visual way of “seeing” and “building” a large team that has to be divided in sub-teams. Using pictures allows you to “see” how the teams will look like. Moving the pictures around is very easy and allows you to visualize different team configurations. The visual effect is very strong here. I go through the effort of making high quality team pictures because they look good and last forever. I take a decent picture of the person, crop it to a 750×750 pixel square, and insert their picture into a Photoshop template I made (available on request) with the logo of the company and the name of the person. Then I print it in glossy photo paper and plastify it (you can fit 12 pictures per A4 sheet). I cut the pictures out and finally I stick a piece of thin magnet to the back. The result is really good and sturdy, hard to explain in writing but the pictures look great, are solid and stick well to whiteboards. Many people ask for them as a souvenir when they leave the team! Some people joke that they look like mugshots, and they’re right :). But they don’t have to, you can take a nice picture with a blurry background too, if you have the required photographic skills and equipment (a reflex camera and a zoom or fast lens). There’s an example of my friend Katie with a blurry office background in the “Elements of Taskboard Design” page. I got this idea from the table tennis world. Specifically, from TTC Rooigem in Gent (where I live). First I did it for my ping pong club and then when I saw the result I thought “Hey, this would look great on my Scrumboards!”. Sure enough, it was an immediate hit… once people got past the embarassment of having their picture taken! Unplanned work: stuff that we suddenly have to do and we can’t plan (meaning we cannot put into the backlog as a story). A typical example is reinstalling a PC after a hard drive crash. You might spend all day at this, and you are obviously not going to wait until the next sprint to fix your PC. Legacy issues: this is any bug or issue that belongs to stories already delivered and accepted, and should be fixed. Why do I put this on top? For unplanned items it’s rather obvious: this is for things you are doing anyways, and are not part of any story. Most teams simply don’t visualize this type of work, but I like all work to be visible, even if it doesn’t add value. Otherwise the day is gone and “nothing” was done. This way at least everybody knows what you are doing. Regarding legacy issues, a general best practice is to fix bugs before writing new code, and implement all feedback from the Sprint Demo before starting with new stories. If you follow those guidelines, legacy issues should have priority over new work. (If for any reason it doesn’t, then put it either in the backlog or in the parking lot). In both cases, we are assuming the work is relatively small. That means tasks, not stories. At most a couple of days of work. 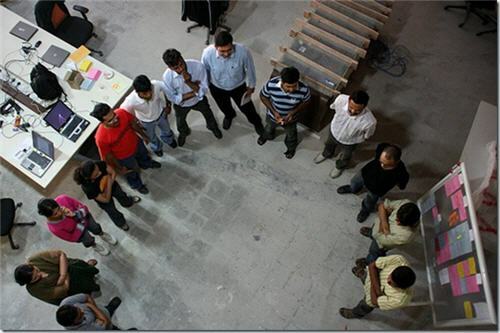 For example, during the Sprint demo, the customer might make a small observation that takes one or two hours to fix. A small change request if you want. How are you going to manage this work? Are you going to create a new story for this? 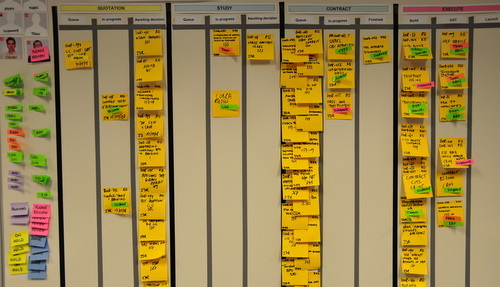 Too much overhead… just put up a task (a post-it) in Legacy Issues, get it done with and forget about it. But be careful with this and always use common sense. If it is story-size work, there is really no excuse not to plan it, it is the PO’s responsibility to tell the customer it will go in the backlog and the best he can ask for is top priority for the next sprint.